Hee hee Celia! I finally had a go at this. Notice all those hits on the tempering page of your blog Fig Jam and Lime Cordial today? That was me. 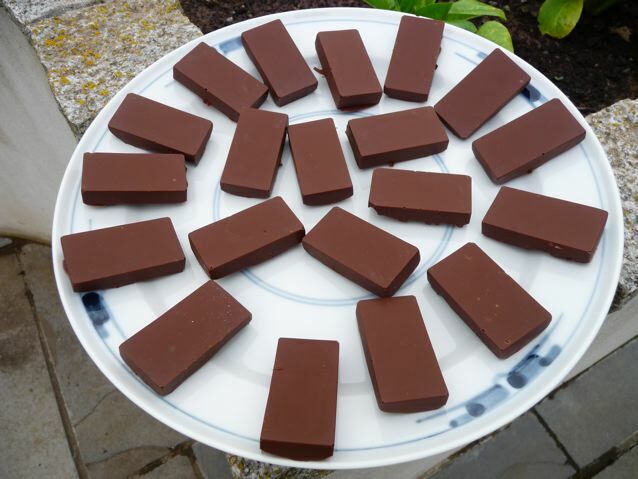 There is only so much reading about home made chocolate a friend can absorb and not want to have a go too. I have resisted for a long time now and today I realised resistance was futile and I wanted to join the Chocolate Borg. I think what I ended up with was tempered, the chocolate squares go snap, the raisin bark bends – but that’s the raisins I think, and the smooth sides are shiny, except where I got finger prints on them… I’ve got a lot to learn – what fun! but the chocolate didn’t scorch or get moisture in it and the chocolate gods forgave me as it was my first time. Brian says this is much nicer than shop chocolate. He’s well versed in the art of compliments when it comes to sweet things. I used a mixture, you can’t see it properly in the pic, of light and dark buttons and assorted bits of chocolate from my stash. 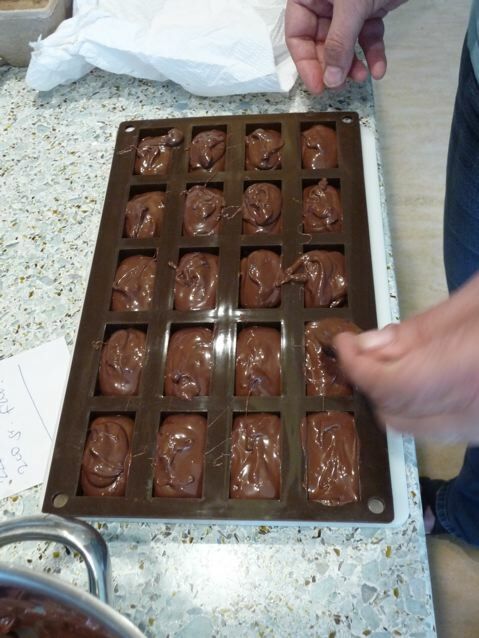 Every piece of tempering chocolate I put in melted and they were all dark, so I couldn’t rescue any of the pieces, but it just means more chocolate in the final pieces. Thank you Celia for your ongoing inspiration! I feel strangely happy! And, I was going to say, if I had one of Inawelshgardens’s lavender bath bombs, my joy would be complete. 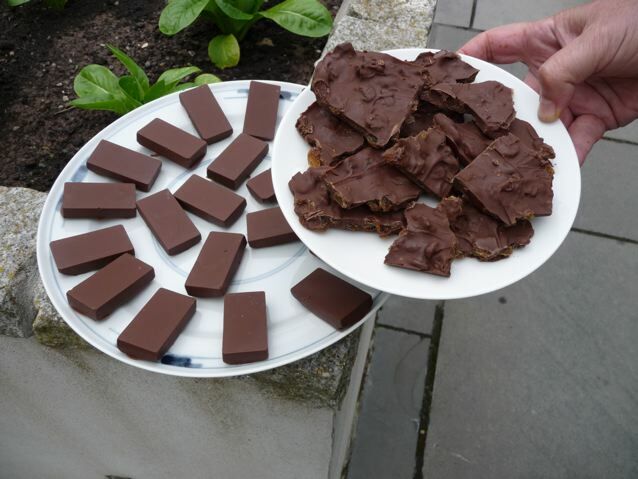 This entry was posted in Chocolate, Pure Joy, Sweet Stuff and tagged chocolate raisin bark, home made chocolate, nutella on 30/07/2010 by Joanna. You are brave! I saw that post, and when reading the word “temper” I decided I could not lose my own, and it was best to forget about it. But you did it! Great job! Beginner’s luck that’s all. I’ll probably go to the fridge in the morning and they will have turned into frogs :) Come to think of it I have seen some chocolate frogs somewhere…..
Christine, the Nutella was bought for this cake – a birthday/Christmas cake for my Dad last year – one of my more successful efforts in the cake department. Another of Dan Lepard’s awesome creations which he describes as ‘A chocolate layer cake for Christmas with a doubly rich gianduja filling’ so that’s nutella, double cream, chocolate….. you get the idea…. oh my, oh my, oh, my……. But I didn’t take a photo of the second one…. wasn’t blogging in those days. Joanna’s notes: So I kept the chocolate treacle frosting in the fridge in a tub, and then I think I beat 250 ml of double cream (Heavy cream?) into maybe a half quantity as above. But our favourite Dan Lepard chocolate cake is still this one . We have a weakness for big juicy chocolate cakes in this house, not so keen on elegant low sugar collapsed ones, we like fluffy cake! Oh. My. Could I ever get into this….. But…. How do you not eat it all before you’re done? Oh wait, I know… Make lots and lots! Hello! Thanks for popping by. 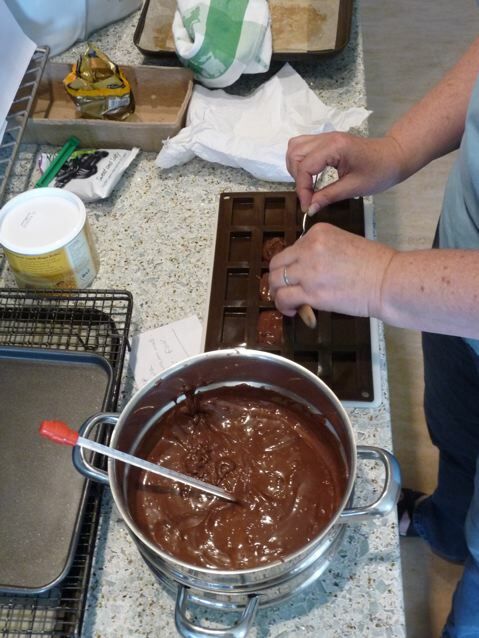 I don’t really do as much chocolate as this post makes it look… but this sure was fun! You are a brave woman! I am timid and lazy and impatient. I really did just slather some Nutella on top of a chocolate bar and inhaled the combination. Good job- they look great! You are a woman of many talents! 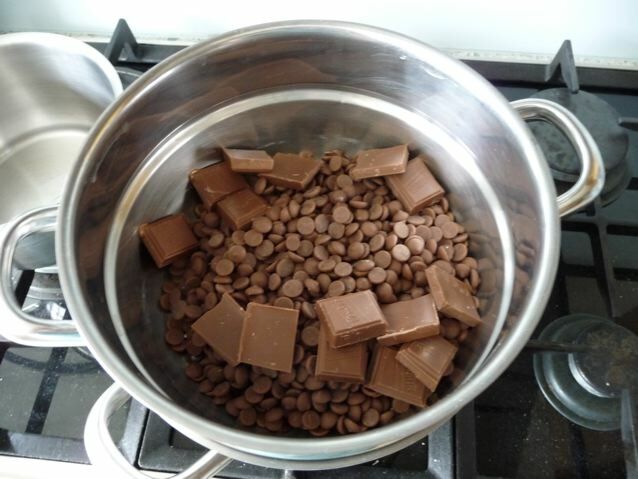 Actually, I was avoiding, or procrastinating as my sister would say – having decided that attempting to emulate Celia’s fine chocolate was far more important than the housework, the gardening, my tax, the rest of my life, in fact anything. Truth was I didn ‘t feel like doing much at all, so waiting for melted chocolate to cool down was almost as good as watching paint dry and the perfect excuse not to do anything else at the same time. Bread has a similar function in my life, long periods of contemplation, brief highlights of activity, and the reward of having an oven with a glass door so you can sit and watch it rise…. this is while Brian scurries around achieving in half an hour what it takes me all morning to do..
It’s just got hot here, I’ve been on the first blackberrying expedition of the late summer, now I have to get the book out and remind myself how to make blackberry jelly. And go for a swim. And that will be it for today. Thankyou SO much for the recipe links, Joanna! And your filling looks just like the original layer cake I’m amazed you can tell them apart. Dee-licious. Well done Jo, I am still too scared to try the chocolate thing yet. I really should though, given how terrible U.S. chocolate is. Celia’s instructions are great and I’ve never had a failure following her advice, maybe I should take a leaf out of your book and just do it. I was scared too. And in fact, I don’t think that one go at it, really makes you confident, bit like finding your way somewhere but getting lost several times en route, doesn’t convince you that you will go the right way next time! But, it’s not like it was for anything in particular, so we would probably have eaten it however it turned out! Don’t know how I missed this one. Joanna, your chocolate is most impressive. I’m still too chicken to try tempering. 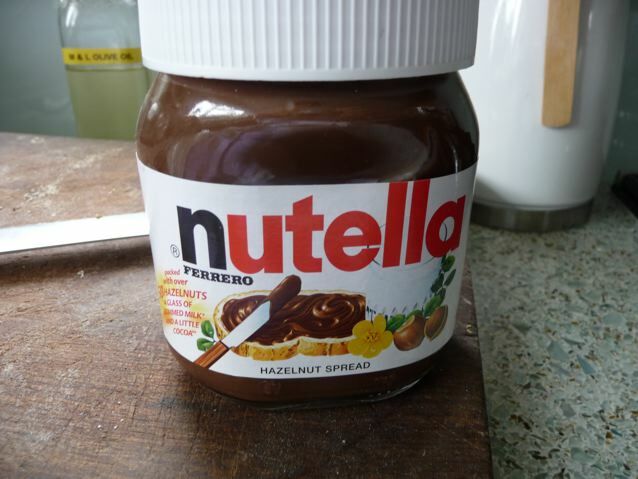 I promised myself I’d give it a go now whilst I’m on holiday – I want to make truffles, but ……..! I should take inspiration from you.